I’m in like with you. No, really. I mean it. You are exactly the person I want to be because you’re cool, you’re funny, and you know how to calm other people down when they’re upset. Those are great attributes to have, and I’m pretty cool too, so maybe we could hang out sometime? Seriously, though, liking someone could be as simple as sharing one hobby in common, as easy as sharing a sense of humor, or as uncomplicated as having the same taste in movies. It could be sustained in any number of ways, not the least of which is spending more time together in various situations. It’s not unlike dating, except you’re not all worried about that kiss at the end of the night. “Like” means you have someone to hang with when you get bored. It means you have a network of people who care about you, who you can lean on, and who can lean on you. It’s like you used to be the only kid with a party hat and “like” came along; now you can point out a bunch of other kids wearing the same hat at the same time. “Like” means it’s your special day every day. And “like” beats love in almost every category. For starters, you need to like someone before you can love them. There has to be something about them that inspires you, that resonates in the marrow of your soul, before love can bloom. And unlike love, “like” isn’t fickle, even at the outset. It’s all about your needs as a human being, and we all need to have someone in the world who is in like with us. So I’m in like with you. 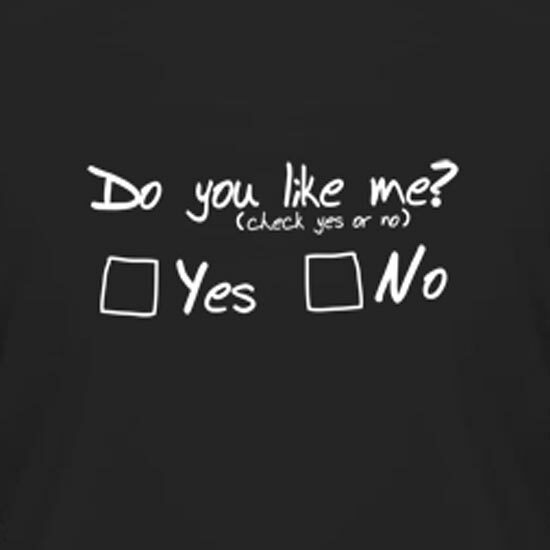 Do you like me too?